Bloomin' long time back that we sampled the baps at Bloomers. In a clear demonstration of the way in which the world works, Bloomers has long been consigned to the compost bin of history while Tea & Antiques thunders on. As Kurt would say, so it goes. 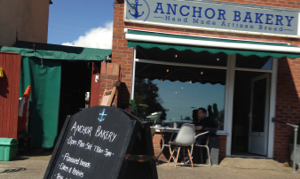 Like Ipswich's very own Artizan, the new Anchor Bakery promises "hand made artisan bread". While they very sensibly offer Cornish pasties and sausage rolls for the more traditional Felixstowe punters, we'll try something a tad more exotic. That'll be some fougasse -- Provence-style bread, of course -- topped with Mediterranean vegetables and chilli flakes, with the odd chunk of chorizo for good measure. Handily, the sun's got his trilby on and there's a handy table right outside with seats for me & Andy & Kev. Fine selection of soft drinks too, from Fentimans to Fruitburst to James White local lemonade. At moments like this, life is gravy. Ten minutes later, we're all stuffed as a cheesy crust. That won't stop two of us venturing back inside to purchase buns from the posh provinces of Chelsea and Bath. More nom, with a decent and well-presented latte on the side. All smiles from the servers, too. If they keep doing what they're doing, this Anchor Bakery should hold. If it was a car -- Skoda Fabia from that 2007 advert. If they were passing by -- Timothy West and Prunella Scales.